But I guess there must be someone out there who doesn't want to be lighthearted or take themselves less serious, and they should definitely bemoan the fact that these people's votes are worth just as much as their vote. And for that they must surely say God bless the America. We have about 2 weeks until the election, and the polls are up and down - hot and cold, like a middle school crush. However, some interesting endorsements hit the internet this past week, and Obama is looking to regain some momentum in the Monday evening debate. 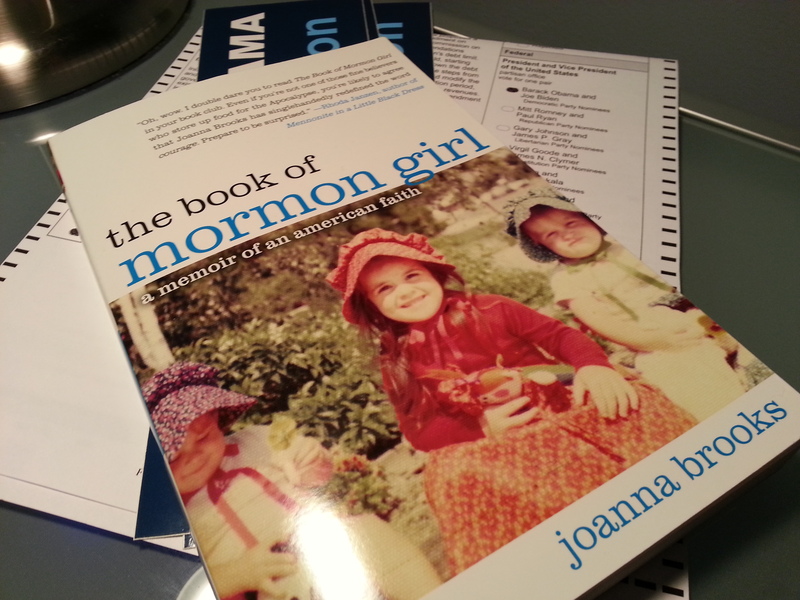 Joanna Brooks, author of Book of Mormon Girl: A Memoir of an American Faith, wrote an editorial piece for CNN's Belief Blog entitled, My Take: Hard truths matter; I’m Mormon, and I’m voting for Obama. While Joanna Brooks has written about the election before on her website, Ask Mormon Girl, this endorsement lays out clear reasons for voting for President Obama in the light of being a mother, an educator, and a Mormon. According to her article, she has been listening for the two candidates to speak to the "hard truths." ...as a Mormon, I grew up with a healthy sense of respect for worst-case scenarios. I was raised, after all, with a religious aversion to debt and a year’s supply of canned wheat, beans and powdered milk in the garage, as instructed by LDS Church leaders. The Mormon food storage tradition isn’t about end-times-paranoia: It’s a lesson passed down from our pioneer ancestors, who knew the importance of being prepared for difficult seasons so you can do right by your family and community. Joanna Brooks reports that she has seen that truth-telling in President Obama: "I have seen Obama work steadily, patiently through a difficult season. I have seen him face some hard truths and accept that there are no easy fixes. And I will vote to give him a second term." Regardless, this endorsement is a bold move for the Tribune, considering that Salt Lake City and its surrounding municipalities are comprised of more that a few Romney-leaning Mormons. Although I guess we shouldn't be too surprised considering that The Salt Lake Tribune has always been kind of gangster in that it opts to retain its Old English tattoo-looking script for its logo while some newspapers create bland fonts like Escrow. On a side note, I am certain that the Tribune's endorsement won't stir up anger the way the Seattle Times has done here locally. They are actually running a series of pro Rob McKenna ads for free. McKenna is the Republican gubernatorial candidate - and you can read more about this on (where else?) the Seattle Times website. People are not happy; I'm not happy. I am concerned that my newspaper is sliding down the hill towards biased reporting, and I can't shake the feeling that little piece of Fox News is being delivered to my doorstep each morning. In protest, I will cancel my subscription tomorrow. I will end this post with one other endorsement: my own. I received my ballot in the mail a few days ago, and I will send it in tomorrow. This ballot was one of the easiest to complete - with only the King County Sheriff race not clear in my head. I voted for President Obama first. And I am excited for another four years with Obama as president. Let's make this happen folks! Mormon Democrats are a rarity in Utah. They represent just 7 percent of Mormons in the state, but came out full force Tuesday evening at an LDS Democrats event held in Charlotte, N.C. in and around the Democratic National Convention. LDS Democrats, many of whom were formerly Republican, say the Democratic party now best represents their core values, including caring for the most vulnerable in society. They are not monolithic in their beliefs however, as LDS Democrats range from feminists to anti-abortion. Thank you to Odyessy Networks for this great video! Want to know how President Obama's policies help families, including the families of small business owners? Watch Whitney's video! "Doubling Guantanamo" was just one reason Kathy switched from leaning towards Mitt Romney to fully supporting President Obama.